Fluid Inflow Detection in Wells & Downhole using Silixa Distributed Sending | Silixa Ltd.
Recognising and characterising fluid inflow along the wellbore can lead to optimisation of the well performance. Silixa’s ArrayLog™ services utilise distributed acoustic (iDAS™) and distributed temperature (ULTIMA™ DTS) data to detect fluid entry points and determine fluid type. The iDAS and ULTIMA DTS can be deployed periodically to detect fluid entry points and determine fluid type by running a fibre optic log as either a slickline, cable or coil tubing intervention. The optical fibre behaves as a sensor array making it possible to log the entire well path continuously without the need to move the cable and so providing information about dynamic flowing conditions in a way in which conventional sensors cannot. 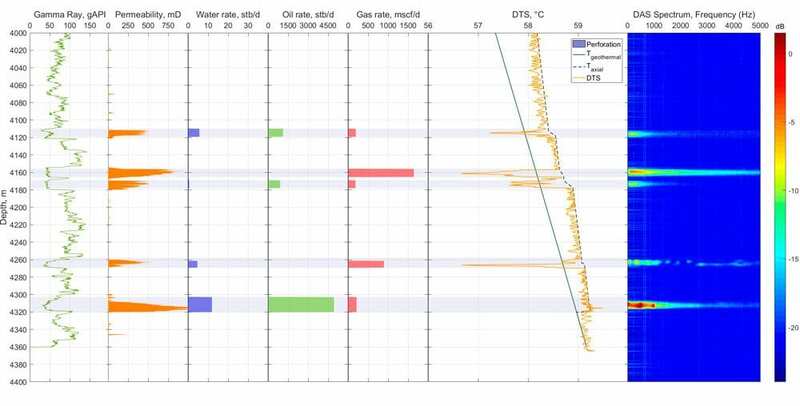 Distributed temperature data has been used in recognising gas entry for many years however its ability to measure liquid entries in horizontal wells is limited. The addition of phase-coherent distributed acoustic data (iDAS™) together with advanced acoustic processing creates greater confidence in recognising liquid entry. Silixa leads the way in its unique combined approach that employs both temperature and acoustic data in inflow detect fluid inflow. Our proprietary computational models are able to differentiate between phases and quantify flow using acoustic and thermal properties of the produced fluids taking the multiphase fluid dynamics into account. Field software allows for real-time integrated visualisation of temperature and spectral acoustic data for quality control and initial evaluation while a post processing platform facilitates advanced data processing and versatile plotting options so that corroborating answers from independent measurements, iDAS™ and ULTIMA™ DTS, can be presented as actionable information to the user. Silixa offers a range of fibre optic cables optimised for iDAS and DTS measurements to ensure a safe, efficient and long-lasting monitoring solution.